Our Funarena! 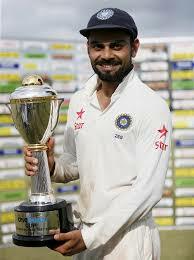 : Test Cricket: Skipper Virat Kohli Hopes For India! Virat Kohli recently made it clear that he should never be compared with legendary Sachin Tendulkar, but it must be said that after Tendulkar he seems to be the main Indian contender to make or break records. In 48 Tests so far Virat hit 13 centuries including a double ton and 12 half centuries having a batting average of above 45. 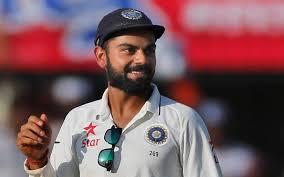 In 2012 Virat was made vice-captain of the Indian test team and since then he had been in the reckoning for the skipper’s post consistently with one of the most outstanding Indian skippers Mahendra Singh Dhoni having both cricketing and non-cricketing ups and downs. However, Virat Kohli’s entry as India’s Test captain was quite dramatic. First, he was named captain for the Adelaide match against Australia in December, 2014 as Dhoni pulled out due to an injury. He made two centuries in the two innings in that match and nearly pulled in off in favor of India. Virat showed his positive frame of mind by going for an outright win instead of laboring for a draw. He became the fourth Indian to make a ton on test debut as captain. His second innings century was hailed by Australian commentators as the finest fourth innings performance ever witnessed by them. After the two losses in the series came the dramatic twist—MS Dhoni retired suddenly as Test captain and left his team in the lurch down under. Virat Kohli was then formally announced as Indian Test skipper from the Sydney test in January, 2015. He hit 147 in the first innings of that match and became the first batsman in Test cricket to hit three centuries in his first three innings as test captain. The Sydney test ended in a draw. In his less than two years tenure as Captain Virat Kohli won 10 out of 17 test matches played so far having the best winning rate as compared to other Indian captains. Although this is far too short a period for that it may still hold a lot of promise for future considering his performances, strategy and aggression. He had two away series—in Sri Lanka and in West Indies and two domestic series—against South Africa and New Zealand and, a one-off Test against Bangladesh that ended in a draw. India under his leadership broke the jinx of never winning a Test Series in Sri Lanka by winning 2-1 in 2015 and this year won 2-0 against the West Indies. In his two domestic series India beat South Africa 3-0 with one match drawn in 2015 and whitewashed New Zealand 3-0 this year. In the recently concluded Test series against New Zealand Kohli also became the first Indian skipper to hit a double ton in the third and final Test in Indore. However, his string of domestic Test victories has been marred by the controversy of providing tailor-made spinning tracks to the host team. On his series win against New Zealand Virat dismissed the controversy by defending his spinners, R Ashwin and R Jadeja, as two of the best spinners of the world who utilized the conditions much more than the opposition. The acid tests for Virat Kohli as skipper would be the away Test series, particularly in Australia, England and South Africa, in near future. However, with his extraordinary batting prowess, his strategically positive leadership and all the cricketing years left in him Virat Kohli may well usher India into a new era of winning more and losing less matches in the years to come. The unique record of his big individual scores almost always translating into wins for his team could also augur well for Team India.